Over the past few years, the policy on education has taken centre stage in Pakistan. There is now debate over reforming the curriculum of madrassas, as they have failed millions of students who have, and continue to receive, their education in these religious seminaries. However, it is not just the madrassas that need reform, but also the ‘elite’ private school system. I have been teaching part-time in Karachi’s private sector for almost a decade, and it is blatantly clear that the current system has failed miserably. Be it private universities or schools, few understand or are interested in the purpose of education itself. The main objective of education is to help people understand how the world works, so they can improve upon it. On a ‘micro’ level, it is about understanding ‘cause and effect’ in both, the natural and social spheres. We cannot build infrastructure without understanding the laws of nature. Similarly, to reform human behaviour, we first need to identify the true determinants of individuals or group action. This knowledge can then be used to achieve various goals, paving the way for personal and societal progress. Whether the aim is to produce a population that values liberty, pluralism, tolerance, non-violence, or building spaceships – the key nonetheless lies within the academic system. There needs to be absolute clarity in the minds of the management, teachers and students – as well as in the wider society – about the aforementioned role of education, because vague or unclear ideas will fail to incentivise the behaviour of the various stakeholders. Unfortunately, for most students, education is just about getting a report card, certificate, degree, and so on, that will propel them to the next stage within the system. It is about getting a 4.0 GPA, or an ‘A’ grade, but not about the act of learning. There is no attempt to understand the real world – education has simply turned into a black box that students acquire before entering the job market. However, students alone cannot be blamed for this. It is the schools and universities that have failed them. For example, schools often force students to take ‘easy’ subjects they do not want to take; those that do not even fit their requirements with respect to their interests, aims and ambitions. 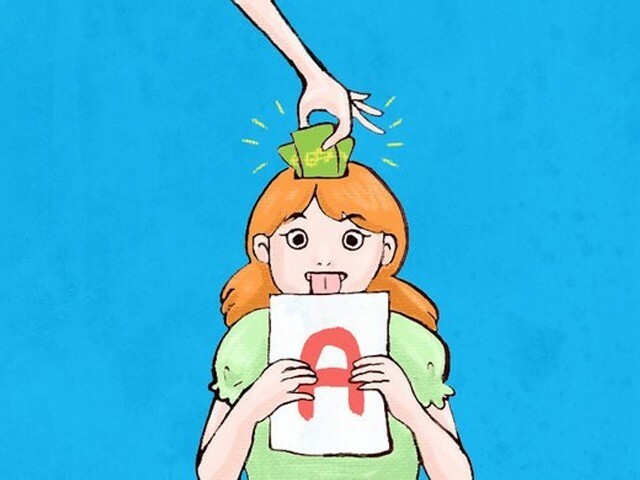 The reason is simple: schools want ‘A’ grades so that they can improve their image, which would attract more students and help the school make more money. Therefore, when a student makes a request to take Economics, they are often advised to take Business Management instead. Someone who wants to study English Literature is advised to take Urdu. If the student is reluctant to acquiesce to the school’s request, they are then told to take the subject privately. The school will not give students subjects they might find interesting, if they fear it will lead to a poor grade (a ‘C’), and thus adversely affect the image of the school. Nor will they help a struggling student with a tough subject, because that would mean putting in more teaching hours, which would increase costs. It’s always better to just give the student Urdu. Private schools and universities in Karachi today have become business enterprises. Their objective is to make profit, not to educate. For these businesses, it’s the bottom line that matters. Even with respect to classroom teaching, the focus is on ‘notes’, not books. The aim is to memorise past paper questions, and then identify suitable answers to those questions from the notes, instead of actually reading the book and learning. This has had visible consequences for our society as we increasingly rely on foreign countries, lacking the skill set in our own environment to fulfil our needs. An anecdotal example would be the Shershah bridge disaster, where we had to call in the Japanese to redesign our bridge. This is an unfortunate result of an education system geared towards making money. How can such a system produce an educated populace? What it does produce, however, is wealth, which explains the explosion in the growth of private schools and universities across Karachi. The aforementioned system has produced hundreds of thousands of students, all of whom have excellent grades, but have extremely poor comprehension and weak expression. It would be fair to say that our private education system is in tatters, producing drones that are great at rote-learning. Most students realise this when they go abroad to study. Their first year is the toughest, because the ‘notes’ system simply does not work. This is usually the first time they actually open a book, and begin their process of ‘meaningful learning’. For the majority, who have to continue their education in local universities, it’s a repeat of the same process, but this time with a different set of books and teachers. On an individual level, I’ve tried to combat some of the issues by eliminating the use of teacher’s notes in class. The students are instructed to read the book and make their notes, which is the only way of improving their skill set. It is a transition which students find extremely difficult, at times even offering money in return for notes or model answers. Additionally, I’ve recommended that parents test their children at home, by asking them to summarise pages from a non-academic book in their own words. Even the readers of this piece can conduct a similar test (ask your children to summarise George Orwell’s essay on “Politics and the English Language”), which would indicate, albeit partially, the intellectual level of the children upon whom a mini fortune has been spent. I hope my article dispels the myth prevalent in our society that the elite private education system is doing a better job than our religious schools, as for them, it is all about money and grades. If the government is indeed serious about reform, it will have to be across the board, not ad hoc or selective reform that ignores private schools openly gambling with the future of our children. say the education system of pakistan has failed. It has all become pure business. I totally endorse that educational institution up to high school level are just business houses and nothing. Even there are some private universities doing same. Students who compete intellectually learn subjects at their own. This is the reason that almost every student in ‘O’ and ‘A’ levels get tuition by the same teachers (mostly) who teaches in these academic institutions. Our education system has totally failed in building citizens, but they make only ‘earners’. That’s the reason our social system has also miserably failed and we are on rat-race to earn more and more irrespective to the means. Being a human we badly lack in humanity and attitude. To gauge this you do not need any scientific research. Just be on roads and see how people act when driving or even walking on roads and streets. See your family; what attitude we have to others. We judge people and give them value economically only. Our education system does not inculcate ‘vision’ or anything like morality and honesty. How this could be, when most operators of these institutions do not have morality, honesty or vision themselves. very valid points , this is happening all across Pakistan. Another point i need to mention is the blatant hypocrisy adopted and propagated by schools in Pakistan. Most bis schools would have a policy of Admission through grade 1 Only. No one is allowed to get into the school in different level of grades. BUT if your dad can fund the school, then they can relax that policy for you. I agree with the overall facts and arguments placed in the blog. However I disagree with the author’s view that the failure of the students in foreign universities in their first year is driven by the notes studying habit. Based on the discussion with my friends studying in the top tier universities of the world, I can say that the short duration of a semester do not allow studying books if the objective is scoring higher in the exams. In fact, the students studying there either use the teacher prepared notes or their own notes prepared from lectures. A well thought out article. Very nicely worded and written. This is something that I am facing with regards to the education of my 2 sons. They are happier to get their questions answered directly (even simple questions) instead of researching the matter themselves. I try to encourage them to ask questions. In fact, I have go so far as to tell them that if I told them anything, they should verify it, question it, question everything and everyone. I know how difficult it is to have a questioning mind. My parents, especially my father, did not like the fact that I as a habit questioned things. Almost every decision or information (irrespective of whether religious or secular), I raised questions. Questions which at that time seemed valid to me and still are valid. Questions asked because I love to acquire information. Not to prove that I am a very smart or knowledgeable person, but rather to satisfy my own thirst for knowledge. However, this was a habit that my father never liked. Still doesn’t. And it is such habits being formed at Private Schools (incidentally, my own sons study in a private school and i am not satisfied with the teaching process or the method of teaching), the habit of quietly accepting something as verified information without verifying it yourself which is encouraged in schools today. The schools are encouraging students to become mindless robots or drones, raising yet another generation of slave class to fulfill the desires and greed of the wealthy. Questioning doesn’t necessarily mean that a person is argumentative or that a person is wanting to start an argument. It is the simplest way of getting information for information sake. It is the also the simplest way of acquiring information and knowledge. To further one’s own knowledge but sadly this habit was not appreciated or encouraged when I was a child and still the situation is the same.